Girls are much less likely to be diagnosed with autism, but that may be because the signs of the disorder can be less obvious than in boys. And girls may be missing out on help as a result. And now we have a story of autism or, rather, of recognizing autism. 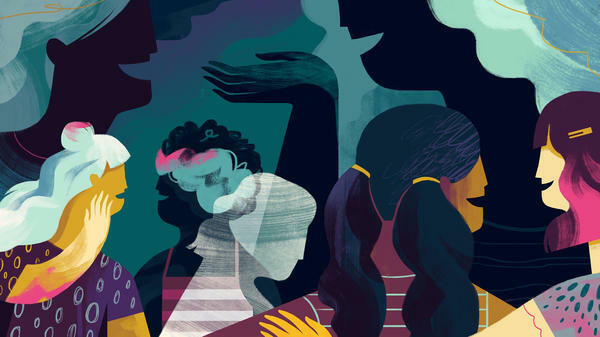 Autism affects the part of the brain responsible for social interaction, and it's estimated that four times as many boys as girls are diagnosed with it each year. But it's possible that the gender gap is not so wide because autistic symptoms can be less obvious in girls. NPR's Patti Neighmond reports. PATTI NEIGHMOND, BYLINE: We're talking about girls with mild to moderate autism and normal to above average IQ. Most are in mainstream schools and many have mastered what UCLA psychologist Amanda Gulsrud calls social camouflaging. AMANDA GULSRUD: They stick close enough to other girls to look as and appear as if they are socially connected. They'll kind of flit in and out of that social interaction, but, in reality, they're not having kind of deep, meaningful exchanges. NEIGHMOND: This observation comes from a study by UCLA researchers who watched autistic boys and girls interact on the school playground with non-autistic children. Gulsrud says the autistic boys clearly stood out. GULSRUD: They're often very socially isolated from that big group of boys doing sports. They may be the kids that are, you know, circling the perimeter of the yard or off kind of by the tree in the back. NEIGHMOND: Haley Wittenberg is one of those girls who appeared to fit in. She's now 20 years old. She was always athletic but didn't like to socialize outside of school. HALEY WITTENBERG: I would always play sports with boys when I was little because, I guess, it was just easier for me and they didn't talk as much. NEIGHMOND: Talking just wasn't much fun for Haley who was diagnosed with autism about one year ago at the age of 19. H. WITTENBERG: I was relieved because they kind of put a name to it. NEIGHMOND: Haley always felt different from other children. Her mom, Lonnie Wittenberg, says she never made eye contact. LONNIE WITTENBERG: I was always saying, look at me, look at me. NEIGHMOND: Haley was rigid, not spontaneous. She wanted to go to the same restaurant and eat the same food, and she didn't like busy crowded places. L. WITTENBRG: She never liked to go to Disneyland. She hated it. She would want to leave. NEIGHMOND: But these seemed like quirks, Wittenberg says. Nothing screamed autism. Haley was bright and articulate which is pretty typical for high-functioning autistic girls, says psychiatrist Louis Kraus with Rush University Medical Center in Chicago. Girls are more likely to mask problems with social interactions, he says. Boys' behavior, on the other hand, is typically noticeable and often quite dramatic. LOUIS KRAUS: For example, they might have an interest in rocks, but their interest overrides anything else. They might have an interest in locomotives, knowing the most infinite details of locomotives. Their interest drives them away from socializing. NEIGHMOND: Girls can also get fixated on things like wearing a particular item of clothing over and over again, but typically, Kraus says, this doesn't cause other girls to ostracize them. And when autistic girls seem to blend in, they can get diagnosed later and lose out, he says, on valuable early intervention. KRAUS: You can always make up academics, never a huge worry if you fall a little bit behind with academics. What is much, much harder to do is to be able to make up social development. NEIGHMOND: Today, one year after her diagnosis, Haley Wittenberg's working to make up for lost time. She attends sessions at UCLA that teach autistic young people how to make friends and keep them. She's learning how to make eye contact and how to sustain the conversation. H. WITTENBERG: So now I'm a lot more comfortable, like, hanging out with people. I can hang out with the same people a lot longer and a lot more often. NEIGHMOND: Skills that don't come easily but are just as critical for autistic teens and young adults as everyone else. Patti Neighmond, NPR News.